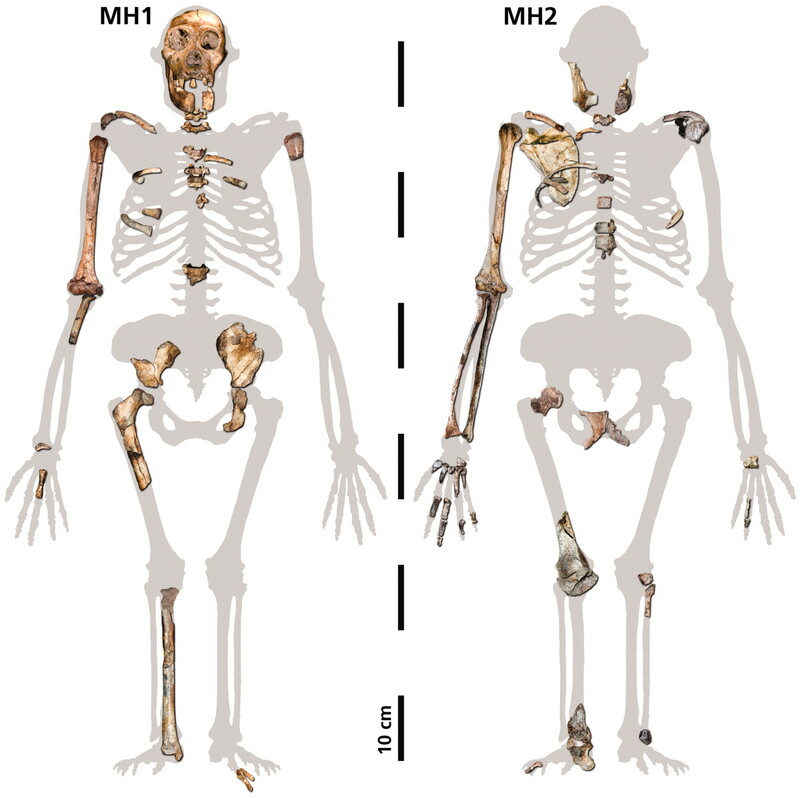 Image 1 illustrates a reconstruction of MH1 (left) and MH2 (right) in an idealized skeleton of A. africanus. 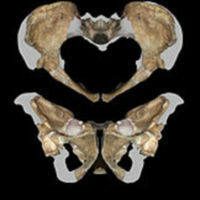 Image 2 illustrates a reconstructed pelvis of MH2. Left side is a mirror image. 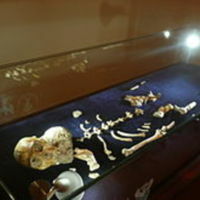 Image 3 illustrates the original skeleton of the A. sediba, holotype MH1, on display at Maropeng, Cradle of Humankind, South Africa. Image 2: Peter Schmid, courtesy Lee R. Berger and the University of the Witwatersrand. The morphological features on the joints of both femora and tibiæ as well as the upper and lower limbs are similar to specimens of A. africanus. 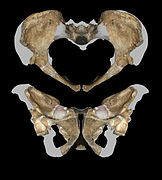 Nonetheless, many derived pelvic features are more modern. A portion of the hip has a pronounced crescent-shape characteristic known as acetabulocristal buttress, a feature unrelated to Australopithecus. Other australopiths have a rather nonvertically-oriented broad shape and less pronounced acetabulocristal buttress (iliac blades). The acetabulum is large, a trait presented in australopiths. Additionally, the midsection or shaft of each long bone shares a ratio range most attributable to genus Homo. MH1 possessed more primitive ankle and foot features like a heel unlikely to endure long periods of running. The ankle bone is relatively flat when compared to derived Homo traits, yet the human-like arch and pronounced heel are traits shared with bipeds. Conroy, Glenn C., and Herman Pontzer. Reconstructing Human Origins: A Modern Synthesis. 3rd ed., New York & London, W. W. Norton & Company, Inc., 2012, pp. 190-192. Berger, L. R., D. J. De Ruiter, S. E. Churchill, P. Schmid, K. J. Carlson, P. H. G. M. Dirks, and J. M. Kibii. "Australopithecus Sediba: A New Species of Homo-Like Australopith from South Africa." Science 328.5975 (2010): 195-204. Web. 18 Apr. 2017. <http://science.sciencemag.org/content/328/5975/195.full>. 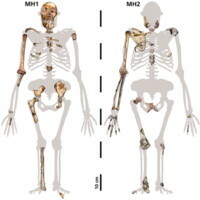 Image 2: Peter Schmid, courtesy Lee R. Berger and the University of the Witwatersrand.Image 3: Wikimedia, “Postcranial morphologies of A. sediba,” Hominid Fossil Repository, accessed April 19, 2019, http://projects.leadr.msu.edu/hominidfossils/items/show/103.